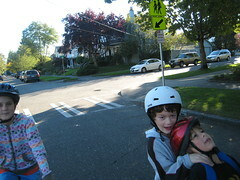 This is most likely the last year I’ll be able to shuttle two kids on the Xtracycle. (sniff sniff) I don’t know what Tim has been feeding them, but the wee ones have grown. They are simply getting too dang big to shuttle around. And now they have friends. And it’s not just their size, it’s their energy. They’re all squirmy and excited and silly. And they laugh and joke and eat lollipops. And sometimes they bonk each other with their helmets. I have to say, I’ll miss this era. There’s nothing quite like hauling squealing kids on a bike. But I know my Xtracycle kid-shuttle days are coming to a close. And the kids must ride their own bikes to soccer practice. This entry was posted in alternative transportation, bikes, cargo bikes, kids, xtracycle and tagged bike pool, bikes, coach, kids, soccer, soccer mom, xtracyle. Bookmark the permalink. Awww…they done growed up…Thanks for the pix. Yeah, they’re a little squirmy. T was a hero on the long ride home. They’re squirmy in a good way…I love those 2 together, they crack me up! Beautiful evening for a ride! That’s sweet. And good to remember…. Yes! 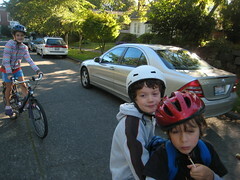 when my kids were both riding back there all the time, I made them get off and walk when they argued/bickered/fought. Worked pretty well. I like silly squirming better. Fear not, perhaps in ten to twenty years you can shuttle grand kids around. And in 40 – 50 years they can shuttle you! In the mean while you could probably rent some kids when you want to reminisce. I’m looking forward to all of that. I can’t wait to take a ride from one of my kids! Oh yeah! I’ve pulled my station wagon over a number of times.